MANOWAR - WARRIORS OF THE WORLD GOLD EDIT. (CD) | Online Shop | Wizard LTD. Album: "WARRIORS OF THE WORLD GOLD EDIT. 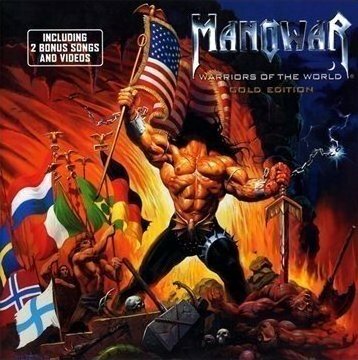 (CD)"
The album "Warriors Of The World" from 2002, which contains hits like "Warriors Of The World United", "Fight For Freedom", "Call To Arms", marks one of the most successful stages of the Kings Of Metal. Gold status in Germany and top notch chart rankings all over the world crowned the nearly two year long campaign, which included a European tour through 10 countries and 35 shows as well as numerous special events and TV appearances. New in 2009 is that bonus material has been added and thus been upgraded to the "Gold Edition". The songs "I Believe" and "The Dawn Of Battle" were only avalable as a singles so far.